MANILA — Twenty five years ago this summer, I stepped inside the Rizal Memorial Sports Complex for the first time. I was a skinny, pimple-faced 16-year-old who was joining the Group 1 (biggest) junior tennis event in Manila. Time travels fast! Last Monday, we stepped inside the same tennis courts of Rizal Memorial. But this time, it was my daughter Jana Marie, now 14, who’s competing in a Group 1 junior tennis tournament. Walking amidst the eight courts of Rizal Memorial these past few days brought back amazing memories. Unknown and taga-probinsya, I recall feeling anxious when I faced the Manila netters 25 years ago. In the National Age-Group Championships that I joined, I faced the No. 2 seed (Giovani Fabricante, I believe, was his name) in the second round. Imagine facing the second-best player in the Boys 16. I won, 7-5, 7-5. What a victory. In sports parlance, it’s called an “upset” and there’s no better feeling: you feel like David slaying Goliath; a Cebuano smashing a popular Manila netter. Thus far here today, Jana won her two matches the other day — including an “upset” of her own, beating the 3rd seed, Nicole Amistad, in two hours and 20 minutes: 6-4, 3-6, 10-8 (super-tiebreak). YAO MING. While the 7-foot-6 star was inside the coliseum named “Mall of Asia (MOA) Arena” last Monday night, we were inside the mall. Yao Ming arrived in Manila accompanying the Shanghai Sharks — who lost two games here against the Gilas Pilipinas and the PBA selection. Only 32 years old, Yao Ming played in the NBA for 10 years (with eight All-Star appearances) — ending his career two years ago because of injuries. 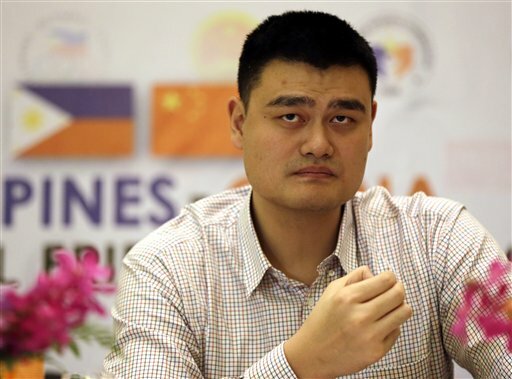 While here in Manila, Yao Ming wasn’t smiling — reports Joey Villar, my good friend from The Phil. Star, yesterday in his story entitled, “Yao Ming no ambassador of goodwill.” Said Joey: “Yao… seldom smiled, got irritated at times, refused to sign autographs and rarely granted photo ops to the fans — and if he did, he frowned at them.” Not good. AEROSMITH. Another MOA Arena attraction here happened last night. It wasn’t sports but another type of entertainment. It’s Aerosmith. Led by the former American Idol host Steven Tyler, this band is the best-selling American rock band ever — selling over 150 million albums. Flying into Manila last Monday, Aerosmith was supposed to perform in Jakarta, Indonesia in front of 15,000 fans. But their concert there was cancelled — due to security reasons. PACQUIAO. It’s final. The date is Nov. 24 and the venue is Macau (The Venetian). As I’ve said in this space before, let’s watch! Well, if you study the past opponents of Rios, you’d conclude the same thing: He’s no Mayweather or Bradley. I scanned his previous opponents and — though I’m no boxing guru like Atty. Jingo Quijano — I couldn’t recognize a single popular big-named star. Which makes an ideal tune-up fight for Pacman. Train extremely hard for six months, win against Rios (via KO, if possible), then arrange for a Part 5 against Juan Manuel or, if he’s willing, that mega-battle all have been awaiting: Manny/Money.